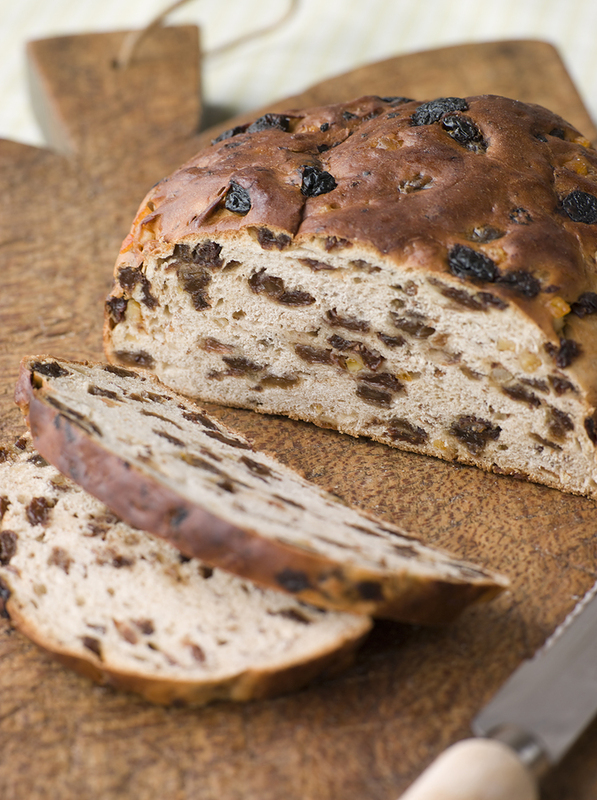 Adapted from The Best of Irish Breads & Baking, Traditional, Contemporary and Festive (Epicure Press, 1996). Note that the recipe has a big range of baking time. The mixture is dense and depending on the temperature of your ingredients, it can vary widely. Make sure to tell folks that there is a ring in there! You don’t want any dental bills. Place the raisins, tea and brown sugar in a medium saucepan, stir to combine and heat until mixture comes to a boil. Stir occasionally to ensure that sugar dissolves. Remove from heat; cool. May stand at room temperature overnight. Position rack in middle of oven. Preheat oven to 350˚F. Coat a 9-inch round cake pan with nonstick spray, line bottom with round of parchment paper and spray parchment. Whisk flour, baking powder, cinnamon, nutmeg and salt together in a bowl; set aside. Scrape raisin mixture into a large mixing bowl. Stir in candied peel, melted butter and eggs until well combined (whisk if needed). Add dry mixture in about three parts, stirring as you go. Combine well but do not over-mix. Fold in the ring, if using. Scrape into prepared pan and bake for about 1 ½ to 2 hours or until the top is golden brown and the cake feels firm. A toothpick inserted will come out clean. Quickly whisk together the sugar and hot water, brush over the top of cake and return to oven for about 3 minutes or until glaze is shiny and set. Cool pan on rack before unmolding. Slice and serve with butter. Best eaten the day it is made. Variations: Campbell offers some other versions. Replace the tea with the same amount of Irish Whiskey (in this case the alcohol will ignite when heated, which is fine. Just take care and let the flame die down); replace tea with cider or replace tea with dark beer such as Guinness.